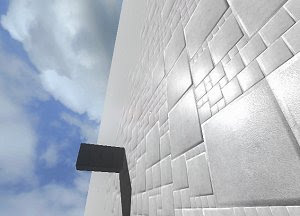 Against the Wall is, apparently, a simple game with a basic concept - the player and a wall, everything else around them and under the brazing sun is emptiness. However, picture yourself in the position of the protagonist and it can become a tale of desperation and last chance, trying to find the only visible way out of this place, a wood construction not so far away. The only way of getting there is through a mysterious object that emanates light and is able to pull stones from the wall. This way we are able to climb the stones, one by one and carefully not to fall. This freeware 3D PC game was created with the Unity engine and can be downloaded or played online at the author’s website.